This interesting family of gemstones come in a range of glorious colours and varieties. As a mineral, feldspar makes up 60% of the earth’s crust, but as gems of jewellery quality they are exclusively rare – more so than diamonds and rubies in fact. Feldspar was first named in 1747 and comes from the German word for field (‘feld’), since it was first found in this type of location. The term ‘spar’ is used generically for any non-metallic mineral with vitreous (glass like) lustre. Chemically, feldspar denotes a group of rock forming minerals distinguished by the presence of aluminium and silica. There are two main types which are of suitable quality for use in jewellery, namely potassium feldspars and plagioclases feldspars. 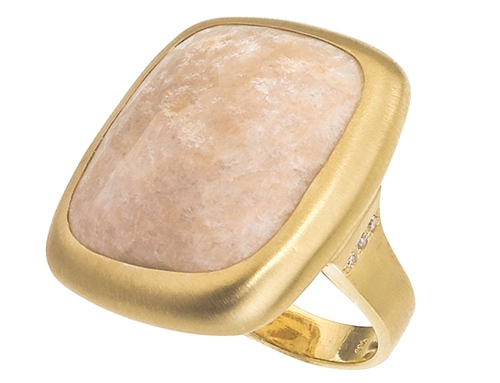 The feldspar group comprises over forty types of stone for use in jewellery and they all possess spectacular colours, generally ranging from off-white to yellow, pink, brown green and blue. While many varieties have a clear sparkle, others are more opaque. Certain types of feldspar have a wondrous fluorescent shimmer - for example, amazonite reflects a subtle green, moonstone displays a whitish-blue to violet-blue dance of colour and sunstone reflects a whitish glow. Feldspar gems measure 6 on the Mohs scale of hardness – this means while they are not utterly fragile, you will need to be careful if wearing them daily. The place of origin and rarity of different varieties have a major effect on their price tag. High value also applies to large, finely cut, flawless, medium-yellow stones, although bear in mind that each type of feldspar gem has individual properties that is valued on.